Teaching about shapes has never been so much fun! 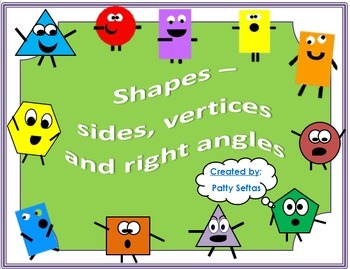 This complete shapes unit is all you need to teach about sides, vertices and right angles. **Shape Game - Pick a card, answer the shape questions and move along the board. Great for Math Centers!!! **Shape Mystery Picture – give directions to the students and see if they can draw the correct shapes in the right places to come up with the mystery picture! **Shape Train game – Spin the spinner, color the coordinating shape on your train. The first person to color all the shapes on their train is the winner! **Flip Book – Use this as a study guide for the end of the unit. **Shapes in Real Life – Draw or find pictures in magazines or newspapers and glue them into the correct shape box.